"Colonel Stonehill said you were a road agent before you got to be a marshal." "I wondered who was spreading that talk. That old gentleman would do better minding his own business." "Then it is just talk." "It is very little more than that. I found myself one pretty spring day in Las Vegas, New Mexico, in need of a road stake and I robbed one of them little high-interest banks there. Thought I was doing a good service. You can't rob a thief, can you? I never robbed no citizens. I never taken a man's watch." "It is all stealing," said I. "That was the position they taken in New Mexico, " said he. "I had to fly for my life. Three fights in one day. Bo was a strong colt then and there was not a horse in that territory could run him in the ground. But I did not appreciate being chased and shot at like a thief." Seven days passed, and then the waters of the flood covered the earth. It was the seventeenth day of the second month of Noe's six hundredth year, when all the springs of the great depth beneath broke through, and the flood-gates of heaven were opened; and it rained for forty days and forty nights on the earth. . . . Rain, with thunderstorms also possible after 10am. Some of the storms could produce heavy rainfall. High near 62. South southeast wind between 10 and 20 mph, with gusts as high as 28 mph. Chance of precipitation is 100%. Monday Night: Showers and possibly a thunderstorm. Some of the storms could produce heavy rainfall. Low around 50. Breezy, with a south southwest wind 21 to 24 mph decreasing to between 7 and 10 mph. Winds could gust as high as 33 mph. Chance of precipitation is 90%. Tuesday: Rain. High near 61. East northeast wind 5 to 11 mph becoming south. Chance of precipitation is 80%. Tuesday Night: Rain likely. Mostly cloudy, with a low around 47. South wind between 8 and 11 mph. Chance of precipitation is 70%. Wednesday: Rain. High near 59. Chance of precipitation is 90%. Wednesday Night: Rain. Low around 50. Chance of precipitation is 90%. Thursday: Rain and possibly a thunderstorm. Cloudy, with a high near 58. Thursday Night: Rain and possibly a thunderstorm. Cloudy, with a low around 48. Friday: Rain likely. Cloudy, with a high near 57. I know. Rain isn't a big deal where you live. But it's another story here in this semi-desert area. It's even worth blogging about. 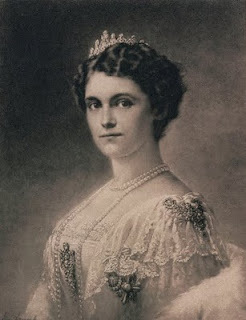 Beatification Of Empress Zita Opens: On Gaudete Sunday, December 13, Bishop Yves le Saux of Le Mans, France, announced that the cause of beatification of the Empress Zita, the last empress of Austria and wife of Blessed Emperor Charles, had formally begun. The process was opened in Le Mans, and not in the Swiss Diocese of Chur, where the Empress died 20 years ago in 1989 in Zizers. It was opened there with the consent of the bishop of Chur, and the permission of the Congregation for the Causes of the Saints, because the Abbey of Solesmes, where the empress frequently went on retreat, is located there. The ties of the empress with Solesmes go back to 1909 when, after studying with the Visitationist Sisters at Zangberg, Bavaria, she briefly went to study with the Benedictine nuns of the abbey of St. Cecilia of Solesmes, the female sister- abbey of St. Peter of Solesmes, likewise founded by Dom Guéranger. In 1926, Zita became an oblate of St. Peter’s Abbey of Solesmes. She also received a papal indult allowing her to spend three months of each year within the enclosure of St. Cecilia’s Abbey. If she is raised to the altars, she will also especially be the model of a wife — the deep religiosity of their marriage being exemplified by the famous words of her husband, Blessed Charles, on their wedding day: “Now we must help each other into Heaven.” Significantly, their wedding day, October 21, has already been appointed as the Feast Day of Blessed Charles. The first two of the links to her husband, Blessed Karl of Austria-Hungary, in the left-hand column are no longer available. But here's a new one: the Wikipedia page has much good information, at least at the moment. ADDENDUM: The links to Bl Karl and his Empress have been tidied up. One of the dead links is a great loss. It was a Geocities site with some wonderful pictures of Bl Karl that I had seen nowhere else. I'm outraged all over again at Yahoo's precipitate abandonment of the Geocities sites. On the first Sunday of the month the traditional Mass is celebrated at the Dominguez Seminary and Claretian Residence chapel. That's the chapel in the picture above. A shame the camera in the cell phone can't do better as it was so much more beautiful in person. 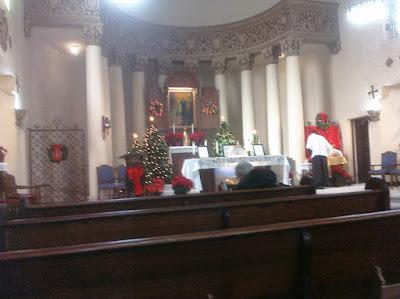 Dominguez is still my favourite venue for the old Mass. Alan Wade on Scottish smallpipes playing The Keel Row, The Marquis of Huntly, and Lexy McCaskill. You get smallpipes today as they are on my mind at the moment. I need to perfect a few tunes for a gig in a couple of weeks and today's practice session was a complete waste of time. The humidity was in the cellar today - 28 at 2:30 p.m. - and the reeds in the bellows pipes are sorely distressed. They like their bit of humidity and under 40 can be a problem. Under 30 isn't worth the time. And today the Border chanter wouldn't tune and the low G and A developed a vibrato. The drones in the smallpipes kept shutting down, too. I knew I should've brought the Highland pipes. But since I'm in a small pipe mood, here's another one. This one has mouth-blown small pipes playing Loch Lomond. Usually not a tune I care to hear on the pipes since it has to be significantly re-arranged to fit the pipe scale. But this fellow does such a fine job with it I may give it a try. Although, to get the right effect may require someone playing along on acoustic guitar. Quite a lot so it would seem. First there was this ruling made last summer that, in accordance with 2,000 year old Catholic tradition, the ancient personal name of God used in the Hebrew scriptures shouldn't be used in proclaiming the scriptures at Mass. The ancient Jewish tradition doesn't hold with using His name at all. Now in this morning's WSJ we learn that the Arabic speaking Christian Malaysians by law cannot call Him "Allah" either. . .something that Arabic speaking Christians have done since before Mohammed was a twinkle in his father's eye. You can read about that here. Aside from the correctness of that last issue, I am oddly pleased that somewhere reverence and decorum do matter and blasphemy is not a good thing. Not here, of course. This is southern California where no-one knows what blasphemy is and "irreverent" is used as a compliment. But somewhere.